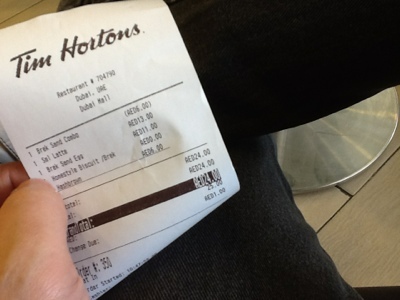 First time I learned Tim Hortons was in the Internet once I was browsing my friends facebook. I saw her picture working at Tim Hortons in Canada. Here in Dubai Tim Hortons just open during the first quarter of 2011 and now 2013 they have branches everywhere in UAE specially in Dubai. Now I am here having my breakfast and this is my first time to eat here. I thought food and drinks here are expensive but i was wrong, It's very affordable like Mc Donalds. Good thing I tried. 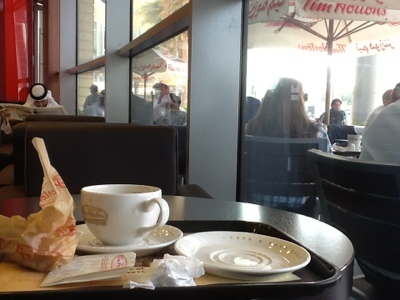 Breakfast combo with sandwich and coffee and a hashbrown cost 24aed a little expensive than Mc Donald. But its okay because in here is very comportable.